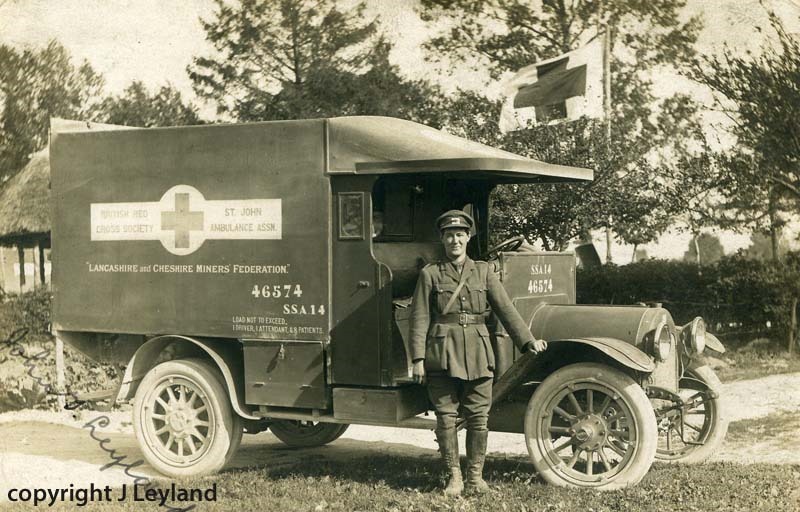 This story about John Leyland and the Friends Ambulance Unit was included in the Festival of Remembrance exhibition at Aysgarth church, November 9-12, 2018. The exhibition has been left in situ for the next few months. Juliet Barker mentioned John Leyland in the address she gave at the Remembrance Service on November 11. John Leyland was born in Bainbridge in 1890. His parents sent him to the Quaker school at Ackworth near Pontefract in West Yorkshire and there he learnt the principles of non-violence which made him choose to be a conscientious objector. In July 1915 it was recorded in the Askrigg section of the Upper Dales Parish Magazine that 30 men had answered the call to serve King and Country. John was listed among those as he had joined the Friends Ambulance Unit (FAU) – group mainly staffed by conscientious objectors. It was set up at the start of the Great War by a group of Quakers who wanted to offer a service that would save lives. The first party of 44 newly trained me arrived in Dunkirk in October 1914. Their first job was to help the 3,000 wounded soldiers lying on the straw-covered floor of the goods sheds at the railway station. There was a terrible typhoid epidemic that winter and so the FAU set up the first of its hospitals, the Queen Alexandra at Dunkirk. Two of its hospitals near Ypres cared for the civilians affected by the bombardment of that city and the typhoid epidemic. The FAU had eight hospitals during WW1, four of which were in England, as well as two hospital ships. The French army medical headquarters asked the FAU to staff and run three of its ambulance convoys (Sections Sanitaires Anglaises) – SSA 13,14 and 19. These French ambulance convoys served the whole length of the Western front during all the major offensives. The FAU sent over 1,000 men and women to France and Belgium. Between July 1915 and February 1919 its ambulances with the SSA and its ambulance trains carried 224,964 patients, and travelled over two million kilometres. Of the 96 Croix de Guerre awarded by the French government to the FAU 78 were to those with Convoys 13,14 and 19. John Leyland was a member of SSA 14. During WW1 26 members of the FAU were killed including five convoy members. His son, Peter, said that it had come as a big surprise to local people to hear, at John’s funeral in 1942, that he had been awarded the Croix de Guerre. He had earned that by continuing to drive ambulances to the front line to collect the injured even when the road was being shelled. ‘One day he could see shells popping up the road towards him. As they got nearer he hopped out into the ditch and the next shell hit his ambulance,’ Peter explained. 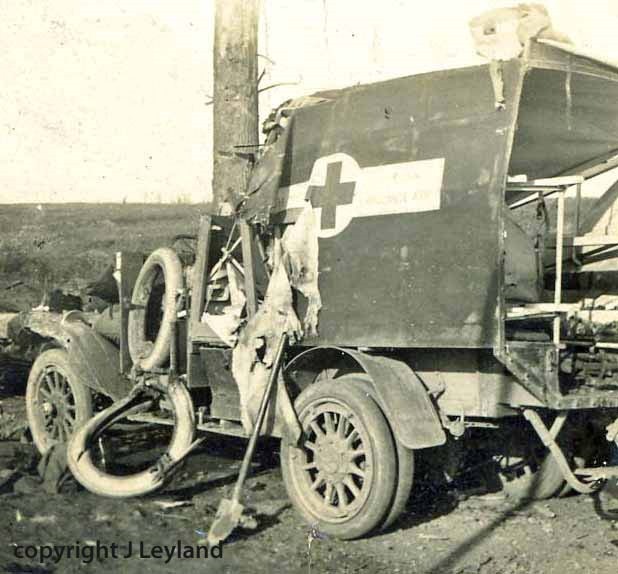 Above: John Leyland beside his ambulance; and the ambulance after it was shelled. Many Quakers (members of the Religious Society of Friends) wear the white poppies of the Peace Pledge Union to remember all victims of all wars and to reflect the society’s commitment to peace since 1660. When he returned to Wensleydale from service with the FAU John was accepted once again as a stalwart of the local community even if many felt he had, as a conscientious objector, “skived” during WW1. In 1918 he inherited the village grocery and drapery shop started by his great grandfather, Alexander Tiplady after returning from fighting at the battle of Waterloo. John, like his father, was also a Wensleydale cheese factor, collecting cheeses from the local farms and selling them to retailers throughout the country. He and his wife, Isobel, whom he married in 1919, carried on running the Bainbridge Electric Lighting Company which his father had helped to set up in 1912. The couple had two sons – Derrick and John, the latter being known locally as Peter. John Snr was chairman of the Aysgarth Board of Guardians, governor of Yorebridge Grammar School, and a member of Aysgarth Rural District Council. He played cricket and also enjoyed playing football with the Bainbridge team. Peter served with the FAU China Convoy during WW2.